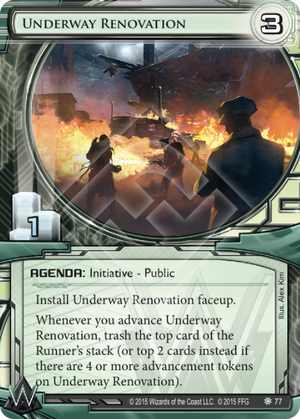 Whenever you advance Underway Renovation, trash the top card of the Runner's stack (or top 2 cards instead if there are 4 or more advancement tokens on Underway Renovation). What is the Underway and how do you renovate it (and why flamethrowers included)? In order to have the full scope, we need to trace back to what was going on in the Spin cycle. Weyland Consortium's own GRNDL Division (which stands for Geostrategic Research and Neothermal Development Laboratories) is a corporation mostly infamous for some shady and really dangerous projects, amongst which there was Project Vulcan - basically, a huge suboceanic mining drill to be used in order to pierce towards the inner layers of the Earth, because who cares about core integrity if you can have free geothermal energy instead? There was some huge beef around Project Vulcan - as it quickly became clear, GRNDL's new toy wasn't all that safe (a grevious constipation, Sherlock!) and several researchers involved issued warnings to the chief executives that its use might cause "major seismic events". As we can imagine, execs did what execs do - fired the damn thing up anyway. But, being Weyland execs, first they bought out the majority of the West Coast (that would be SanSan Megapolis) and insured it for some huge piles of money. Just to be safe. Said major seismic event basically ruined a huge part of SanSan seaside in one huge earthquake. Roughly thousands were presumed dead. Some dedicated individuals worked long and hard to make the truth known to public. Some got arrested, but eventually succeeded, even though the Consortium stopped at nothing to cover the thing up. The consequences were dramatic. Apart from a huge PR blow, Weyland Consortium was forced to take up many costly renovation contracts in order to rebuild what their greed destroyed. Amongst the districts that were hit the most, there was industrial Oaktown, Hollywood and... The great SanSan monorail. That's where begins the SanSan cycle - and our trip around the third greatest city in the world, right behind NeoTokyo and New Angeles. Now Underway is not a district per se. It is, more accurately, a slang name for the suburbs which span beneath the SanSan's longest monorail track. Also, quite coincidentally, not the nicest place to be, full of people of questionable motives, and significant presence of criminal element, now stirred up due to damage suffered in the Vulcan pandemonium. Basically, not anybody willing to comply with corporate interests. That monorail was a landmark really important to the SanSan's infrastructure. It had to be repaired. But it couldn't be, with working poor all over the place. They wouldn't move, so they had to be moved. Hence the trailer parks burning throughout the night. This card is really well-designed in ludonarrative terms, as its mechanics and the story it tells are perfectly woven together. The further you advance your actions in Underway, the more of the Runners' possibilities dwindle, as their contacts are forcibly relocated to somewhere else or die in a fire. Which, of course, means the milling of the Stack. I love to use this card in Argus Security: Protection Guaranteed deck, paired with Casting Call and some quick, cheap barriers - the faster you begin the mill, the higher the chance of hitting something important - for a damned-if-you-do-damned-if-you-don't-scenario. It's my way of challenging the runner: "Look, I'm killing everyone you've ever cared about. Come and stop me. It’s been a long time coming but after many a candle-lit vigil FFG have answered my prayers. Golly, my knees are sore from such long entreaties – but it’s all been worth it because everyone’s favourite feline terror Hellion Alpha Test now has a tag team partner. In Netrunner, the cats herd you – into the path of Weyland’s renovators! I think that’s some home improvement we’d all like to watch …accompanied by the smell of burning flesh. Midseason Renovation deck: Midseason the runner for say... 10 tags. Play Psychographics on this. ??? Profit. Seems quite plausible. Getting money with Weyland is not an issue and Midseason for a lot of tags is not a hard thing to do. It is very Weylandy. Killing all the runner's poor friends while renovating the neighbourhood.